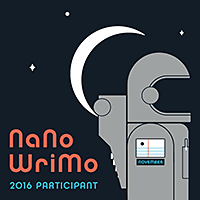 November is upon us, and for writers, this means National Novel Writing Month (NaNoWriMo) is here. After resisting its lure for so long, I decided to give it a go. Here is my profile; and the novel I planned. I plan to strategically not win, but that’s another post. Writing is not easy. Every time writing feels like crossing the Sahara desert with chains on my ankles, thumbscrews on my fingers and my head in a vice, I ask myself: why write?